It is a North Myrtle Beach resort that is located at the Cherry Grove Fishing Pier. This beautiful high-rise on the beach has spectacular North Myrtle Beach condominiums inside and an inviting oceanfront pool deck outside. An adjacent parking garage at Prince Resort means you can keep your vehicle out of the elements during your North Myrtle Beach vacation. The colorful lobby of this North Myrtle Beach resort will put smiles on everyone’s face as it welcomes you to a fantastic North Myrtle Beach vacation. Prince Resort is a bit of a dream world as the oceanfront pool deck is a playground for kids and adults alike. The beachfront is vast and you can see the Atlantic Ocean and white sandy beaches from throughout Prince Resort. Listen to the waves crash ashore from the pool deck, the fishing pier and from your private balcony when you stay at this North Myrtle Beach resort. 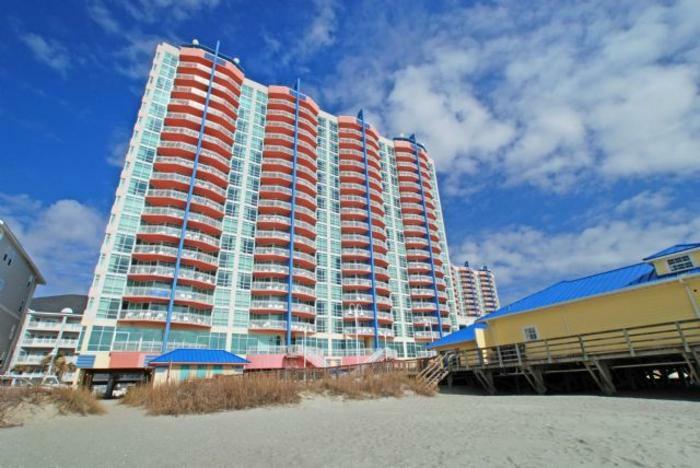 This high-rise North Myrtle Beach resort has 16 floors of North Myrtle Beach condominiums. There are several floor plans from which you can choose. The one-bedroom, one-bath North Myrtle Beach condominiums at Prince Resort sleep four people. There are two-bedroom North Myrtle beach vacation rentals that have two baths and sleep six, eight or 10 people. The largest North Myrtle Beach condo rentals at Prince Resort have three bedrooms and three baths. These North Myrtle Beach rentals sleep 10 or 12 people. Your North Myrtle Beach vacation will be superb with spacious accommodations like these. The interiors of these condominiums in North Myrtle Beach, SC are beyond elegant. Upscale furnishings, rich colors and high-quality amenities welcome you to the beach when you choose Prince Resort for your North Myrtle Beach vacation destination. The dining area is adjacent to the breakfast bar in these North Myrtle Beach vacation rentals. The kitchen has a dishwasher. The master suite opens to the balcony. Prince Resort is simply gorgeous and your family will love every minute that you spend at this North Myrtle Beach resort. With furnishings that you will fall in love with and amenities that make your life at Prince Resort a pleasure, this North Myrtle Beach vacation is destined to be perfect and full of picture-worthy memories. Elliott Beach Rentals is not affiliated with onsite management or the HOA of Prince Resort.